Steampunk Maker: a carboard Gramophone! As we’re looking forward to Asylum the weekend after next, we thought we’d post this cover we quickly recorded while filming out upcoming video for Boilerheart. Like our Sparrow video, this was done live in one take! We hope you enjoy it and please feel free to share it far & wide! So, we’re finally playing in London again… We’ve a bucket load of new songs since our last outing in the capital and look forward to sharing them with you! Many thanks to Beatnik Events for organising the evening – we’re on at 9pm and entry is free. Four of Hollywood’s leading men in a contemporary character study, Gary Oldman, Garrett Hedlund, Jamie Bell and Willem Dafoe, also stars of the autumn/winter fashion showcase in Milan, are the distinct subjects of this extraordinary gallery – transposing cinematic codes to the world of menswear in the series of three-quarter length portraits. The campaign – shot by David Sims – layers different codes of dress in a subtle parody of power and role-play. Exaggerated poses and conspiratorial glances hint at the game, a palm solemnly placed on the heart or into a pocket with precise formality. As a little pre-Waltz on the Wye treat for you all, we thought we’d release a video we made of our cover of Simon and Garfunkel’s beautiful song, ‘Sparrow’. Let us know what you think. Click on READ MORE at the end of this post before playing the track, or else it’ll stop when you click to read more. Ok, so I lied at the end of my last post – this isn’t Toto’s Africa. I’ve had no internet access for the past few days and since I didn’t have Africa on my computer, I had to go for something I did have. Next time it’ll be Africa – I promise! I first heard this song at university when a friend leant me a Jethro Tull cd. I’d never really heard them before, but this song convinced me of their genius. I am by no means an authority on all their music, but I love this song (along with The Whistler and Heavy Horses). I also love the way they manage to combine folk, jazz, classical, funk and rock – not something I’d think was possible. The Witch’s Promise is something else, though, and the more I listen to it, the more I hear in it. 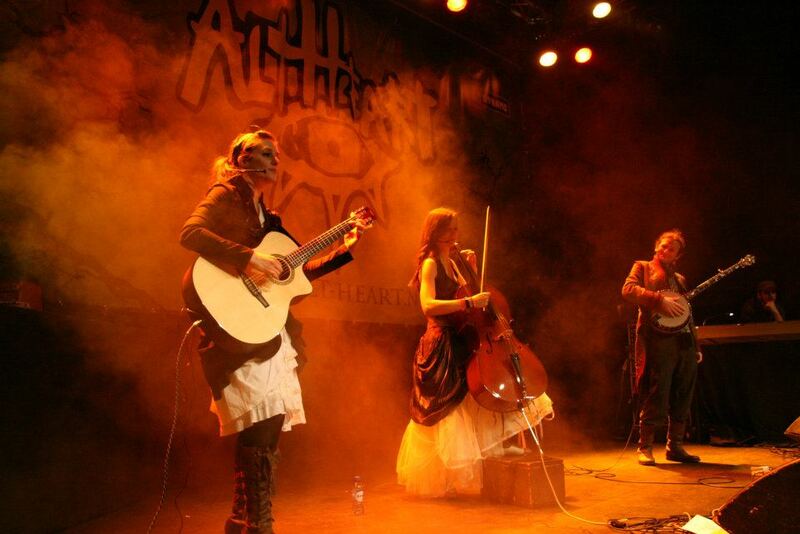 When we first started to get into gigging, I decided that I’d get myself another cello. 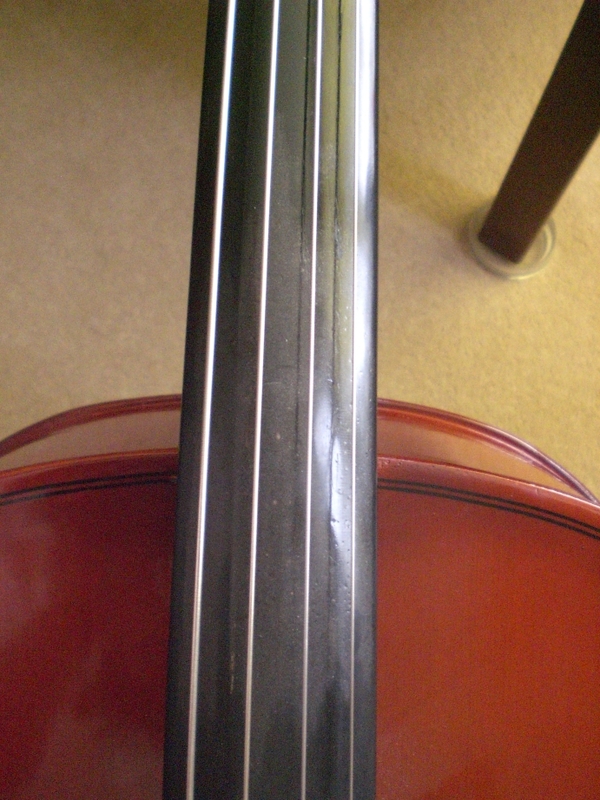 The cello I refer to as my ‘real’ cello is a mid 19th century English cello. I’ve had it since I was 16, and it’s a beautiful instrument with a big sound. I was, understandably, rather nervous of taking it around to gigs. Much googling later, I alighted on a cello someone was selling that looked like the kind of thing I was after. Since I use a pickup for gigs, the actual sound the cello makes isn’t of so much importance. The vibrations from the bridge go down the wire and eventually out through the sound system, and the quality of the sound depends more on the sound engineer and the system. 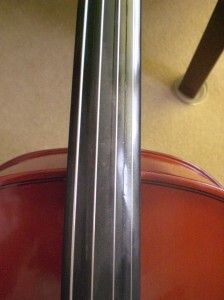 I use a Shadow cello pickup (recommended by another cellist friend) and so far it’s served me well. 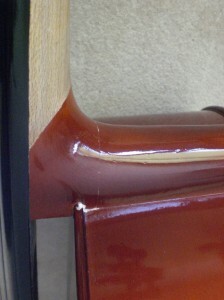 This cello was new, not so pretty and not in possession of the delicate proportions of my beloved ‘real’ cello – perfect! I needed something that could withstand some hard use, and this was it. Not good. I suspect it had received a significant blow to the back of the top of the case, and the force snapped the base of the neck away from the shoulder. There’s something really sad about seeing an instrument like this! 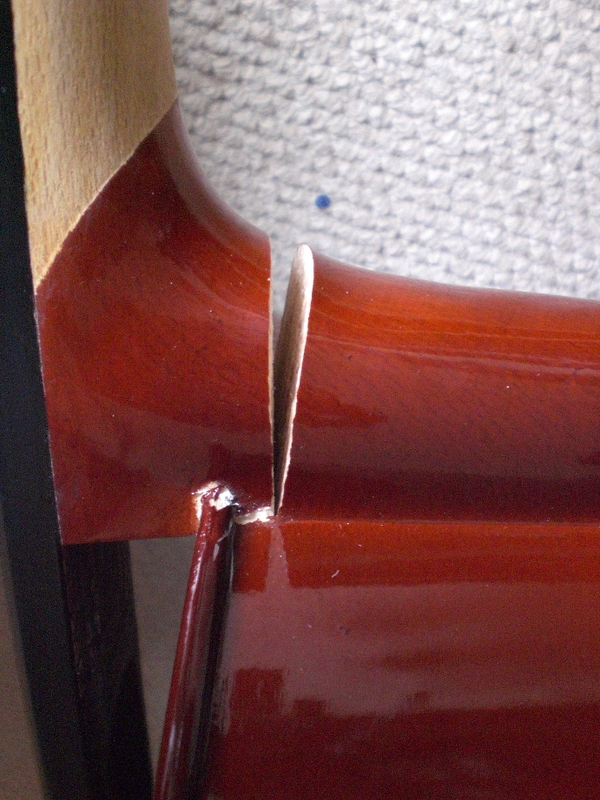 Luckily it was insured, so I got my money back, and the seller didn’t want the broken cello returned. Replacing a neck is an expensive job – more than this cello was worth. So… I had a chat with Will, our banjo player. Will is (amongst other things) is a very good prop maker. If anyone could fix this cello, he could. So I handed it over, and with the aid of strong wood glue and a large screw drilled through the front of the finger board into the solid wood at the base of the neck, he put it back together again. The tension of the tightened strings is significant, so the force pulling the crack apart is great. Will did a brilliant job, and over a year later everything still works fine! You can’t even see where the screw went in. We had a great time at Eindhoven! Thanks to Bjorn from Primula Productions and everyone at Dynamo for a fun night. We had a good time backstage chatting with La Lune Noire, who were on before us – two very nice guys. It just shows that it is possible to drive from Brighton to Eindhoven in time for a 4pm soundcheck! The Dutch are very friendly people, and we enjoyed every minute onstage and off. We’re definitely up for more international gigs now! For more pictures, see our facebook page.